If this vehicle looks familiar it’s not fortuitous. It is related to the American LAV-25, a well-known figure of the Iraq and Afghan war, a derivative of the Swiss MOWAG Piranha 8×8, and one of the most successful western wheeled multirole vehicle of the last three decades. 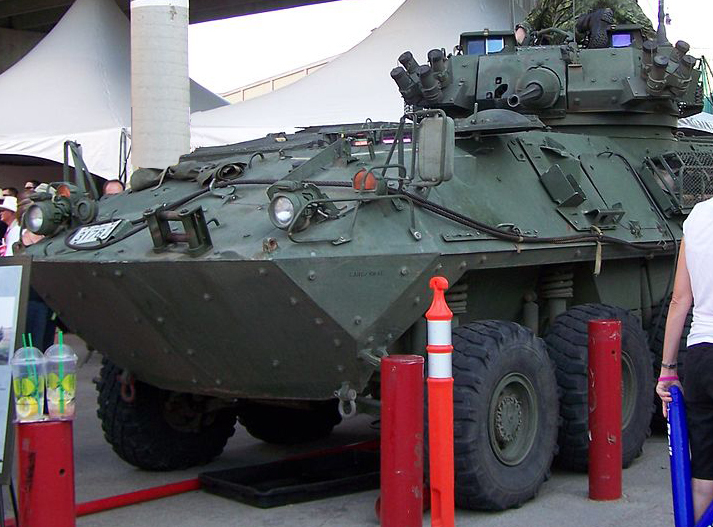 The Coyote was, in fact, a licensed version of the Piranha II by General Dynamics Land Systems Canada for the reconnaissance role. It was to replace the GDLS-Canada 6×6 family of Armoured Vehicle General Purpose (AVGP) comprising the Grizzly, Cougar and Husky from the late 1970s. It joins a fleet of relatively similar vehicles, the Bison APC (1988) and the LAV-III IFV (1999)) based on the 8×8 Mowag Piranha II and IIIH versions respectively. The Coyote was developed on the LAV-II in the early 1990s and is 14.4 tons (versus 17 tons for the LAV-III). Of similar hull shape to the Bison/LAV-II, it is fully amphibious, NBC protected, have automatic fire extinguishers and Halon 1301 plus ozone safe suppressant in the crew compartment, as well as central heating and cold weather equipment, starters, etc. The hull is protected much like the LAV-II by an armor ranging presumably from 8 to 13 mm, but with add-on armor panels that claim some protection against heavier rounds. Compartmentation comprises a front right engine, left driver (hatch over three vision periscopes, central IR), a missile fighting compartment for the commander, gunner and surveillance operator at the rear where the equipment is stored. Access is granted by two rear doors, two rear hatches on the roof, one for the driver, the commander cupola, and left-hand side escape. Propulsion consists in a proven 275 hp Detroit Diesel 6V53T with an Allison MT653 transmission (5 fwd/1 rv), one Transfer case, four automotive differentials, and dependent 8 wheel with a selectable 8 WD and full time 4 WD (rear), with powered steering and brakes. Top speed is 100 kph governed (120 ungoverned), for an operational range of 660 km. Agility is helped by a turning radius of 15.5 m and the ability to cross a trench 2 m wide, climb a 60% gradient or run on a 30% side slope. The armament is in the turret, comprising the M242 25mm chain gun (210 rounds), coaxial C6 7.62mm LMG and cupola-pintle mounted C6 7.62mm manned by the commander (660 rounds total). In addition, the turret front faces receive 2×4 76mm Smoke and fragmentation grenade launchers (8 reloads). All periscopes have 2 levels of laser protection (upgraded to three) and the commander’s cupola’s 7 periscopes gave a full 360° view. Other equipment includes the DIM 36 target acquisition sight, low light GEN III image intensification sight and the remote thermal sight display HIRE. The gunner’s sight is also equipped with DIM 36 and HIRE. Both the gunner and commander have access to the laser warning receiver. Navigation equipment includes a digital compass system (DCS), and PLGR global positioning system. The Coyote is also fitted with a Self-recovery hydraulic Winch. The all-weather under armor surveillance set inside the rear compartment comprises remote surveillance sensors mounted on tripods connected by a 200m optic composite cable (MSTAR), a battlefield surveillance radar (3200 mil azimuth coverage, range doubled with electro-optic sensors), NODLR, and thermal camera. At a brigade level, each vehicle has a telescopic 10m mast for the sensors and radar and similar equipment plus the high-performance FLIR. Of course the gunner, commander and observator have access to the eye-safe laser range-finder (range 10 km) with a system for all-weather recognition/identification of targets 12 km far. 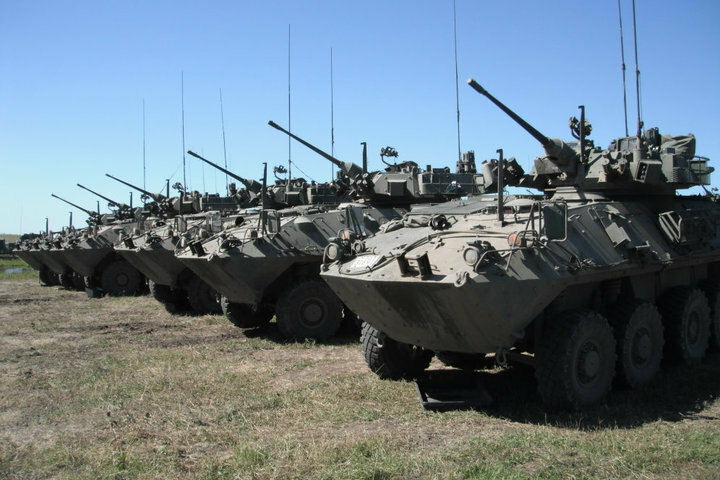 This equipment makes the Coyote one of the best specialized reconnaissance vehicle worldwide. The Canadian Coyote was in service by 1997, and saw action first in Bosnia and Kosovo with IFOR in 1999 and secondly in Afghanistan in 2002. Some also protected the G8 summit. Missions include reconnaissance and surveillance (group and brigade tactical levels). The Coyote is also proven for strategic mobility (air transportable by C141, C5 and C-130 Hercules), tactical mobility and protection against soft and light armored targets. The Coyote came as a Reconnaissance version, command version, battle group kit version and fixed brigade kit version. Total production 203 in 1996-99. Coyote of the Royal Canadian Dragoons (Armoured), 2nd Canadian Mechanized Brigade. Coyote in Afghanistan in 2002. 12ème Régiment blindé du Canada, CFB Valcartier, outskirts of Quebec City. The write up has some incorrect information , the Coyote was accepted into service in 1997. First deployed to Bosnia in 1999,Afghanistan 2002. There are three versions of the LAV-25 (Reconnaissance), command version, battle group kit version and fixed brigade kit version. The line drawing of an Afghanistan Coyote should read 2002, which was the only time they were painted in CARC TAN. I saw one this past weekend at the Canada Army Run and learned they humorously call the crewmember in the rear hull position the “GIB”, short for “Guy In Back”! He’s the hapless soul who gets the job whenever there is a need for someone to get out and examine something on foot.